Ever wanted your own face on your watch? You can now do that if you own a Fitbit Versa or Fitbit Ionic through your Snapchat account to bring through your Bitmoji avatar. Your Bitmoji avatar can now cross over to your watch face, and there are over 50 different animations on offer for your character. What your Bitmoji is doing will vary on what you're trying to achieve or what time of day it is. If you're nearing the time to go to sleep, you'll be greeted by your character sleepwalking. Have you read our Fitbit Versa review? 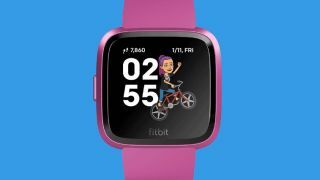 Bitmoji is a plug-in service that works through Snapchat to allow you to create an avatar of yourself, and you can see a variety of them below working on the Fitbit Versa watch face. To get it set up on your smartwatch, you'll have to download a specific watch face from the Fitbit store and then it'll connect to your Snapchat account. From there it'll pull through your pre-made character. You won't be able to change the facial expressions on your Bitmoji or anything yourself, and instead it seems like the system is automated by Fitbit itself depending on your motivations and goals.